BUFFALO, N.Y. - Starter Mike Shawaryn pitched six strong innings and Rusney Castillo belted his first home run of the season as the Pawtucket Red Sox bested the Buffalo Bisons for the second consecutive night, this time 6-4, on a chilly Tuesday night at Sahlen Field. Shawaryn (1-0) fanned seven and walked only one batter while limiting the Bisons to just one run and six hits. 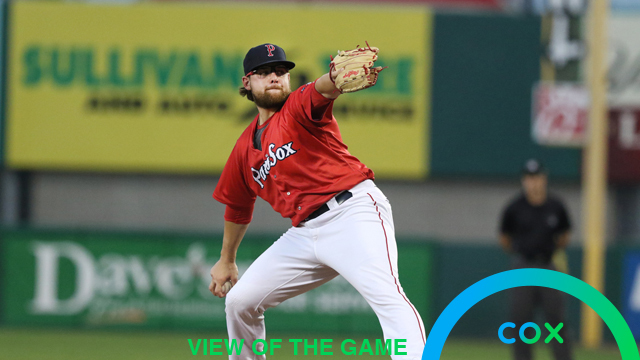 It was the longest outing of the season thus far for a PawSox starter, and 58 of his 84 pitches went for strikes. Domingo Tapia allowed two runs in two innings, while Bobby Poyner struck out three straight in the ninth after allowing a run to finish his first save. After Pawtucket struck for three runs in the third against Buffalo starter Jacob Waguespack (1-1), Castillo smashed a breaking pitch from Waguespack deep out to left field in the fifth with two runners on base to put the visitors ahead 6-1. The reigning I.L.-batting champ hit just five long balls in 2018. Nick Lovullo, whose father Torey both played and managed for Buffalo and is a member of the Buffalo Baseball Hall of Fame, made his second start with the PawSox and drove home the game's first run with his first Triple-A hit in the third inning. He finished the night 3-for-4 with two runs scored and a stolen base. Jordan Patterson went 2-for-4 with two separate RBI doubles for the Bisons. The PawSox go for the sweep of the series in Buffalo on Wednesday at 1:05 p.m. Pawtucket right-hander Erasmo Ramirez (0-0, 4.50 ERA) is scheduled to oppose Bisons southpaw Shawn Morimando (0-1, 6.00 ERA). Radio coverage on WHJJ (920 AM and 104.7 FM) and throughout the PawSox Radio Network begins with the pre-game show at 12:35 p.m.